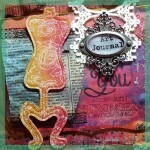 Are you interested in mixed-media and art journaling? 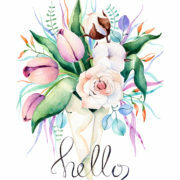 Every day is a brush stroke on the canvas of your life, so we’ll be focusing on techniques using a variety of mediums and stencils from Art Anthology and my line of Palettini rubber stamps from Technique Junkies. 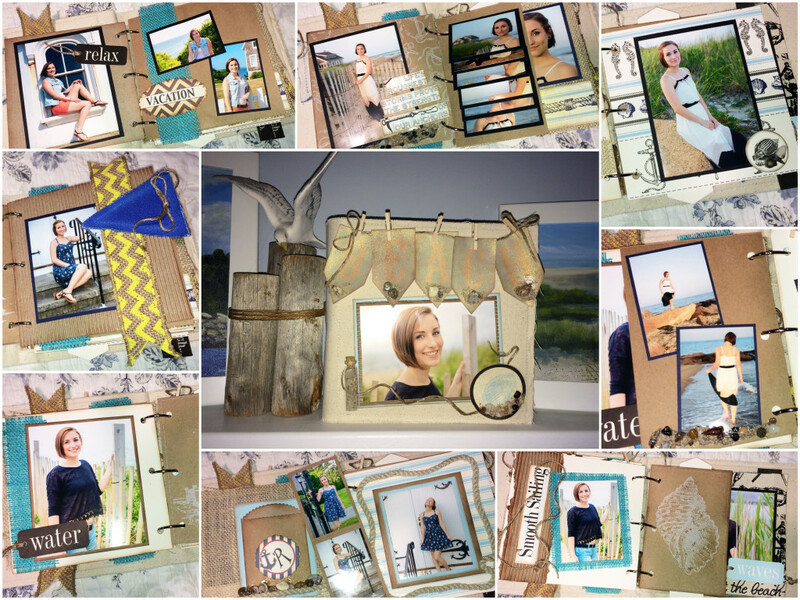 Create some stunning backgrounds and dimensional effects to use as a basis for your 6″x9″ book to document your colorful life! 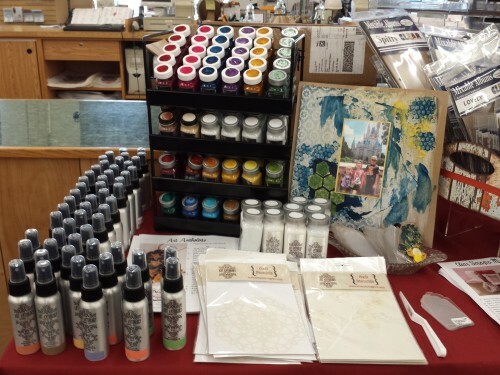 Learn how to mix it up with ink, sprays, gel mediums and texture pastes. In this hands-on workshop you’ll get quick results that will get you pumped-up and past any barriers that have kept you from feeling confident with these mediums. 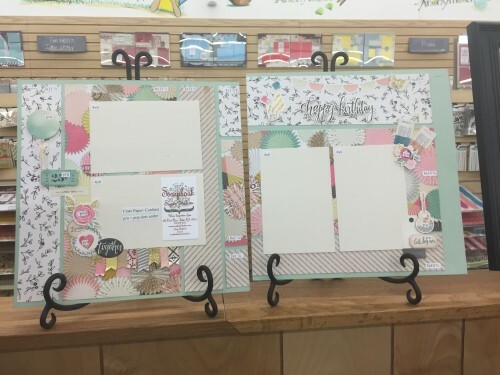 In this informative hands-on workshop, we will explore Art Anthology’s Colorations sprays and my line of Palettini rubber stamps from Technique Junkies and discuss how to mix colors and color theory while creating a beautiful, feminine 12×12 scrapbook layout. 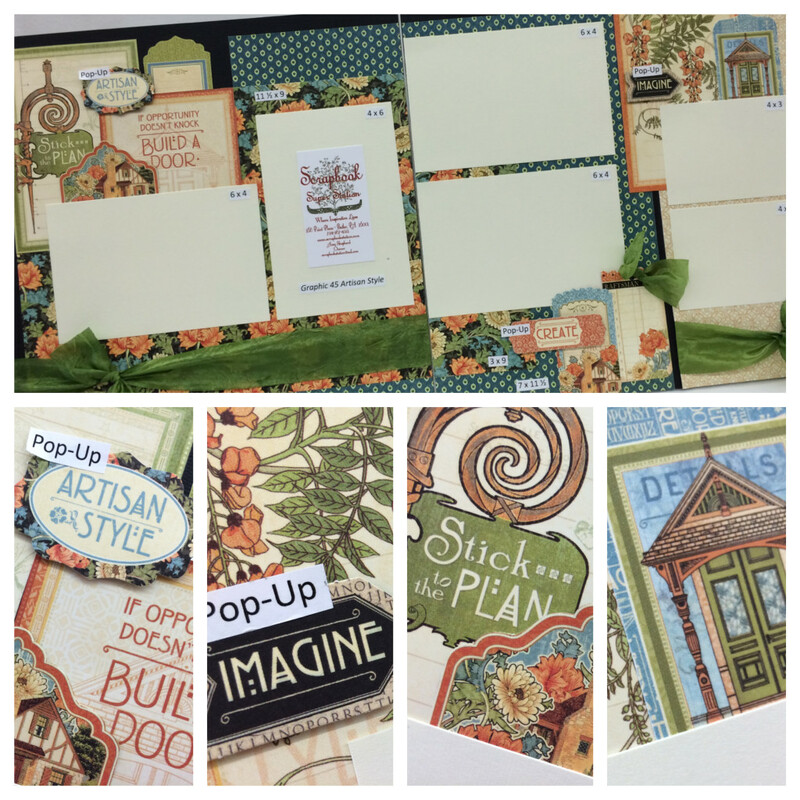 Using Prima printed watercolor paper as our backdrop, customize your embellishments and make it uniquely yours. Get watercolor confident and gain skills you can use on all your creative projects! 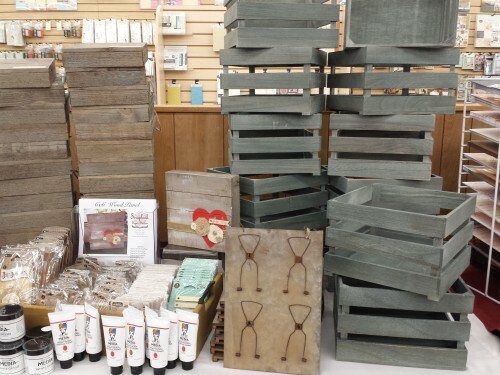 We just received a 430 pound pallet of NEW product from Tim Holtz Idea-Ology, Cosmo Cricket and Storage Solutions! We will have this all out on the floor this afternoon…check it out ASAP…there are some amazing new products to play with like: Comso Cricket’s Gallery Blocks, Watercolor Blocks and Splatter Cubby, Tim Holtz’s Flip Frames, Clip Carousel, Vintage Mini Mason Jars, Trophy Cups and Salvaged Dolls and Storage Solutions new Super Stackers, Weave Bins and Craft Carts! 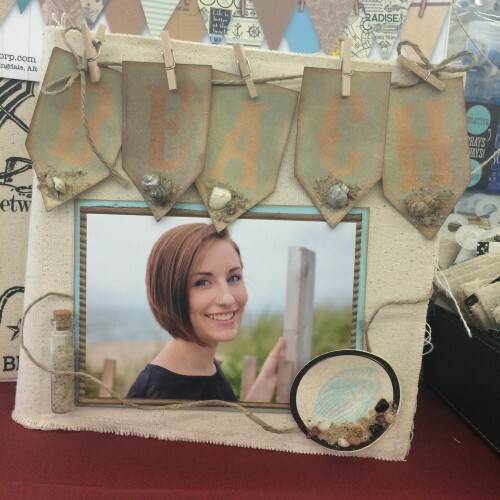 Sand and Sea Album Kit Now Available For Purchase! 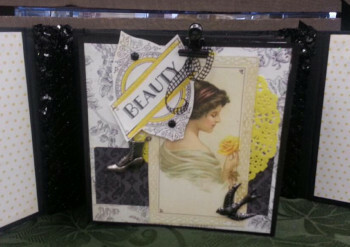 Now you can purchase a kit on our online Boutique to make this amazing 6×6 Canvas Album!!! Click the picture above to go to our online Boutique and purchase yours today! Quantities are limited, so do not delay!!!! We have just added a bunch of new layouts to our online Boutique! Please take some time to take a look and place an order today before they are all gone! Quantities are limited, so don’t delay! 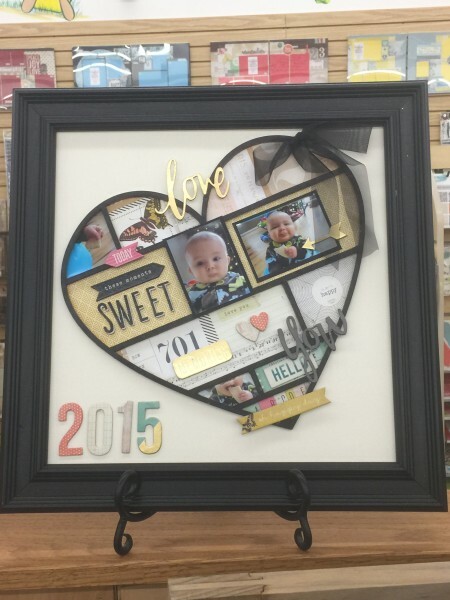 This amazing gatefold album is an upcoming class in our store! We know you will not want to miss this special album that would make a perfect mother’s day or grandmother gift. 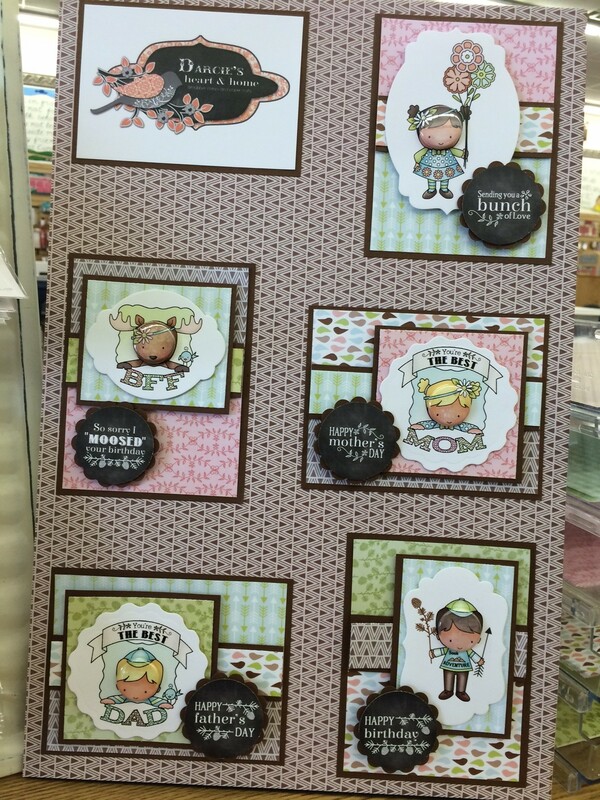 Check out this month’s adorable new board program from Darcie’s! 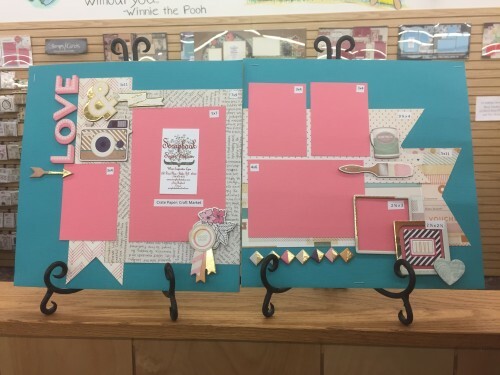 Perfect boy and girl stamp sets that also have Mother’s and Father’s Day sentiments to make them even more versatile!!! And who doesn’t love their Tin Pins??? Get in here quick for these sweet stamps, they will fly out the door! 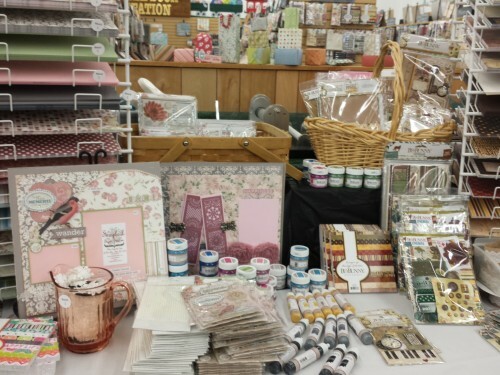 We had an amazing time at Amy’s Favorite Things on Sunday. 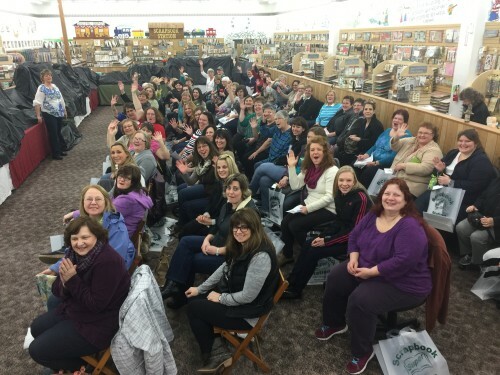 Just look at all these happy, excited ladies! We unveiled one company at a time and explained all about the new and exciting things that they had just released. And along with each company, everyone received a goody! 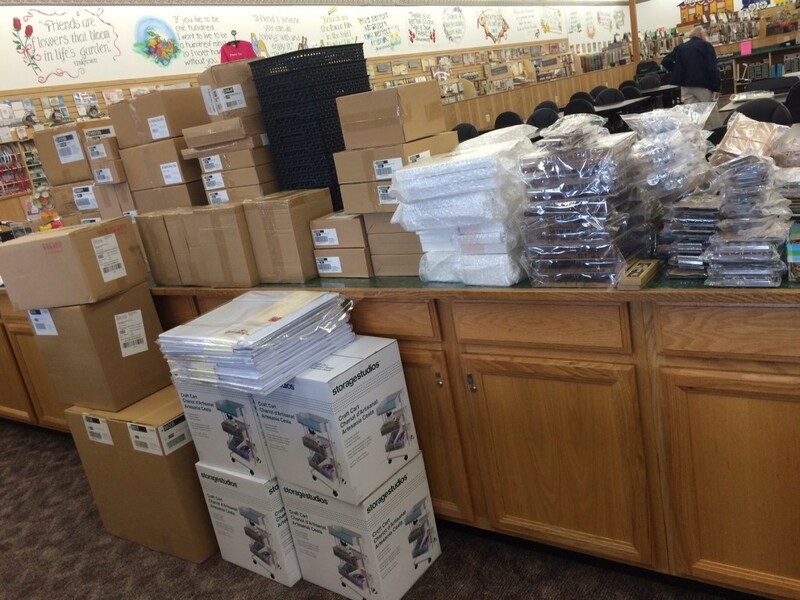 Attendees walked away with almost $160 worth of BRAND NEW merchandise! How amazing is that? Art Anthology was our first company. 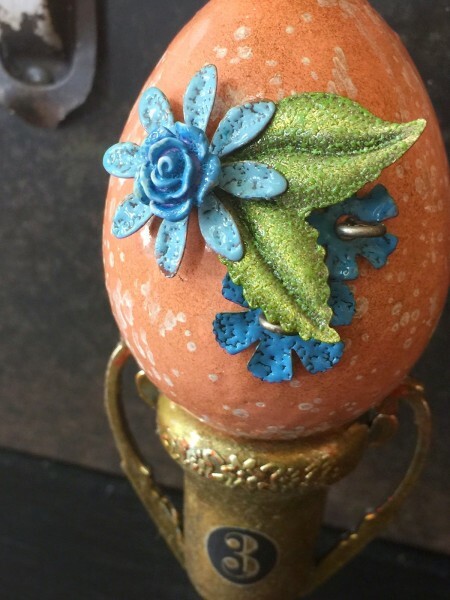 Their new Gemstones are a dimensional mixed media medium that is super cool and fun! 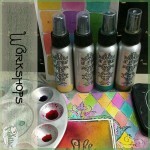 And since Art Anthology is a new company all together for us, we also unveiled their Sorbets and Colorations sprays. Next up was Clear Scraps. 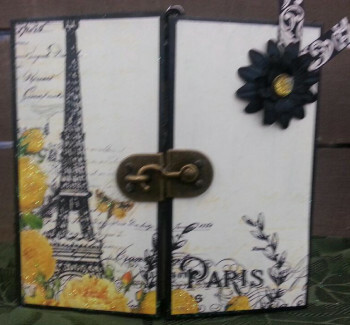 They have brand new Mixables albums that combine acrylic and chipboard pages. These albums come in fabulous sizes and themes, such as Magical (aka..the big theme park that starts with a D) and beach. 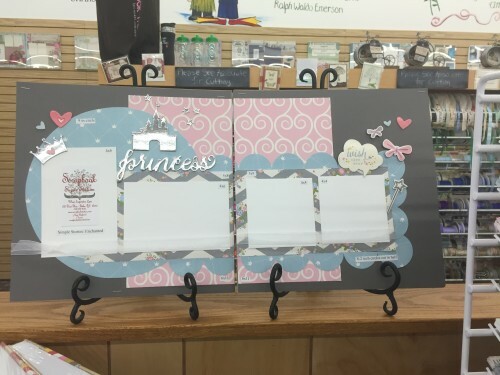 They also have gorgeous clipboards that make great art pieces! 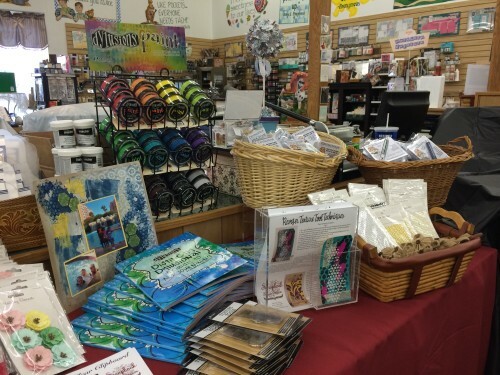 We were thrilled to reveal the new Dyan Reaveley Distinctly Dylusional idea book and her amazing new paints! Plus, the new Texture Tool from Ranger combined with these paints (and the Dimensional medias from Art Anthology!) give stunning results! 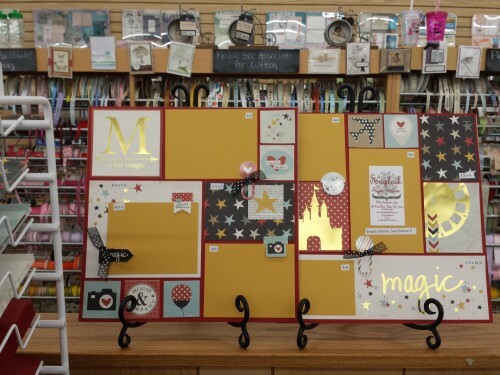 There are three fabulous new collections from Simple Stories: I Am, Enchanted and Say Cheese 2. 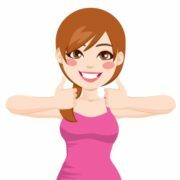 I Am is all about documenting your own feelings and story. Enchanted is for the princess in your life and say Cheese 2 is for that magical theme park that beings with a D! The new Wood Creations are absolutely amazing! And everyone went nuts over the H M E word that has different inserts for the “O” for every month that matches the seasons and holidays! 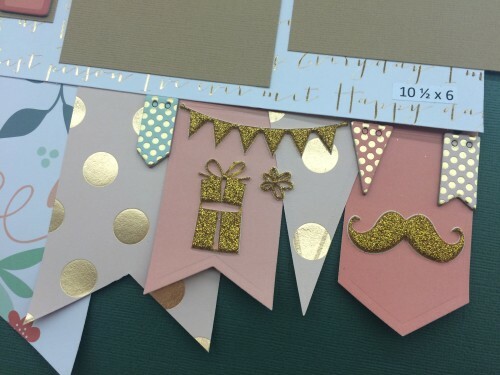 The two new Crate Paper lines, Craft Market and Confetti, were huge hits! Especially the wooden collage heart above. 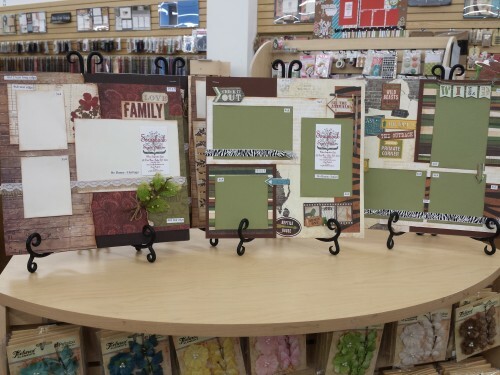 By far the biggest hit of the day was this 6×6 canvas album that went with a Mix and Match Sand and Sea pack of papers from Canvas Corp. What fun using all that printed cardstock, corrugated paper, burlap and canvas all together in one album is!!! 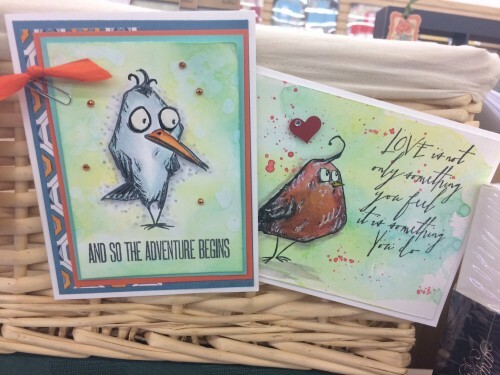 I would have to say the next hottest thing was this adorable “Crazy Bird” (or as I was calling it…the Perturbed Bird) stamp set from Tim Holtz! We also introduced several other brand new stamps from him! 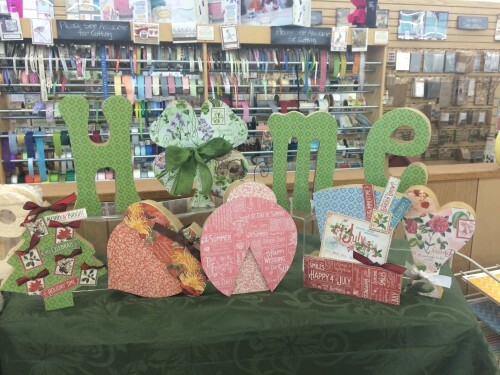 The girls also got a chance to try their hand at Wendy Vecchi’s new enamelware technique! 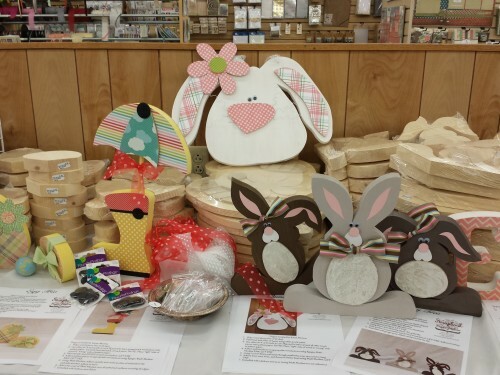 They had fun making chipboard look like enamelware and they got a starter kit! *Photo above courtesy of Wendy Vechhi’s Studio 490 blog. 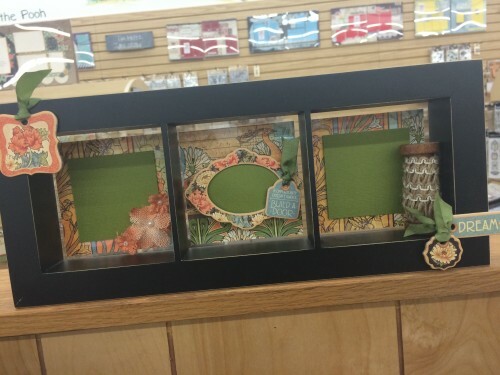 The new shadow boxes from Graphic 45 were another big hit. Everyone received this black one and they couldn’t have been more thrilled! Bottle Cap was our next company and can you say WOW?? 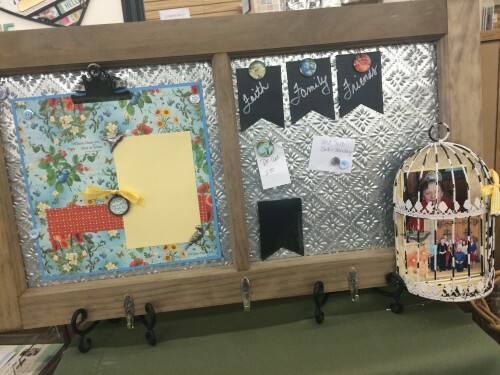 This awesome “Window Frame” turned magnetic memo board was a favorite of a lot of the gals and the adorable, vintage birdcage inspired a lot of creativity! 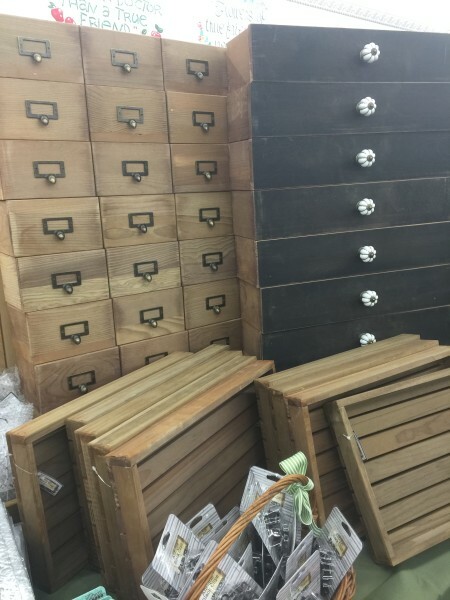 Bottle Cap also introduced these great wooden trays and “drawers.” The “apothecary” drawer was a fast seller and the black wooden one a close second! We couldn’t have an AFT event without My Mind’s Eye! Their new lines..Hello World, Fancy That, On Trend and Niche…are all wonderful! On Trend and Fancy That are full of gold foil and trendy color pallets and Hello World is a new travel line that will fit any trip! 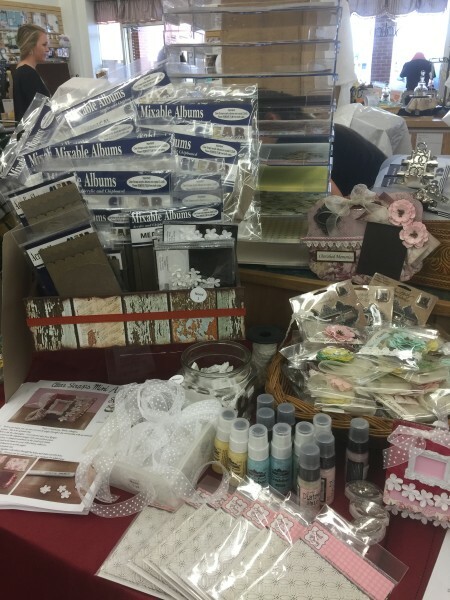 Hampton Arts is known for their stamps…but now they are making a dent in the Home Decor and organization arena as well. 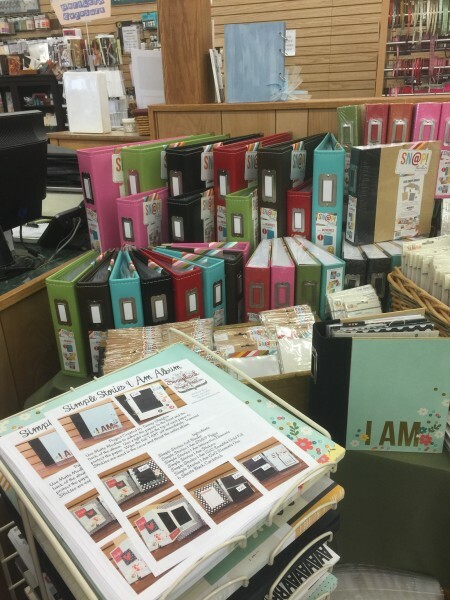 These fabulous crates and chalkboard fronted bins flew out of the store and the new home decor surfaces are so much fun! 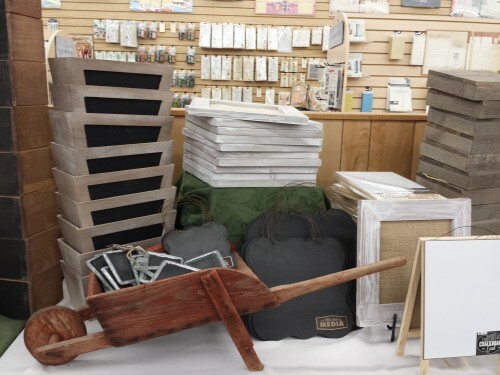 The 8×8 wooden “canvas,” the Burlap pin-board and the chalkboard/magnetic easel offer the creative thinker so many options! Another regular favorite of ours at AFT is Bo Bunny. We introduced their five new lines….Carnival, Safari, Garden Journal, Heritage and Forever Young. 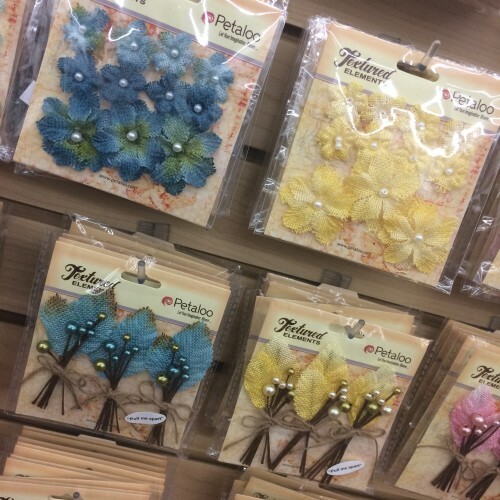 We also showed these amazing new burlap flower sand picks from Petaloo! They come in so many yummy colors and match just about every line we have in the store! 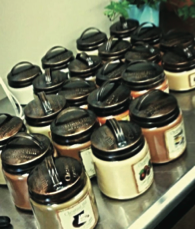 This month we are featuring our Chestnut Hill Candles as our Product of the Month. If you haven’t checked out these amazing candles yet, this is the time! These spy candles burn clean and the jars clean out beautifully to use for storage afterwards. The Chestnut Hill Candles are made in the USA right in West Virginia, so you’ll be supporting a close by community when you buy their candles. Oh, and have I mentioned how amazing and different some of their scents are? Because they are! 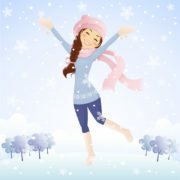 And they are 25% off this month for all BPC members!